Loyalty...hmm interesting. Something like loyalty to a spouse, to a friend, to a company to a brand should always be acknowledged and rewarded. I don't mean diamonds and flowers and trips to exotic places. I mean rewards like a thank you or a discount or even an acknowledgement that I made a difference. It has been an interesting few years with Lemons and Steel! We are proud of the friendships we have made and the clothes that we have sold. We have high standards here at Lemons and Steel. If we have missed the mark and have ordered something that looks less than great on someone we will take the loss. It is not so much about selling clothes for us, it is about spending the time to find things that make the customer feel beautiful. I do have to admit though, sometimes what one person loves the other does not. We have met thousands of women through our business. It is has been a real pleasure and a learning curve for me. I love love love working with women. Every woman that steps into our booth or contacts us by email shows their power and their importance. 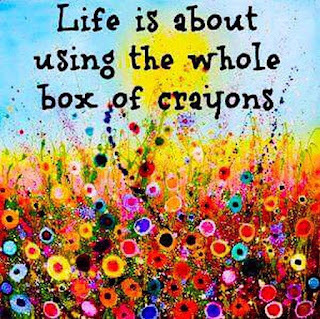 And life is about using the whole box of crayons - coloring each day with all of our crayons and just enjoying life! To celebrate and thank everyone for their support, Lemons and Steel is launching the Lemon Club. The Lemon Club is an exclusive club created to thank our dedicated customers. If you have spent over $500 with us we will be sending YOU a Lemon Club membership card. This card will give you 10% off any products your purchase from us. No restrictions...no time limit. Within the next few months many of you will be receiving the card along with a special thank you gift from us at Lemons and Steel. Loyalty to us is worth it.